The electrical contractors have been rewiring the workshop and one of the consequences is there has been no power to the large bench saw. This has been having an impact on the type of work Richard can undertake. We had a rethink about the priority of work and decided to start on the main bedroom. The first task is to construct the wardrobes either side of the front door. Each wardrobe has been designed so its door will open into the passageway. 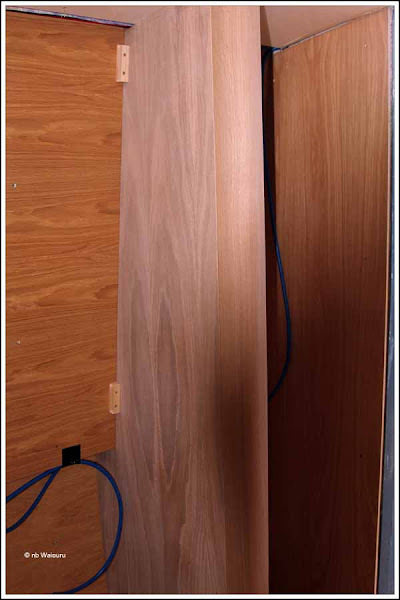 The corner of the wardrobe has a quarter-round moulded section of vertical plywood to take the sharp edge off the corner. Using a jigsaw, Richard and I scribed and cut the wardrobe side panels. These were then plumbed and held in place with small timber blocks. 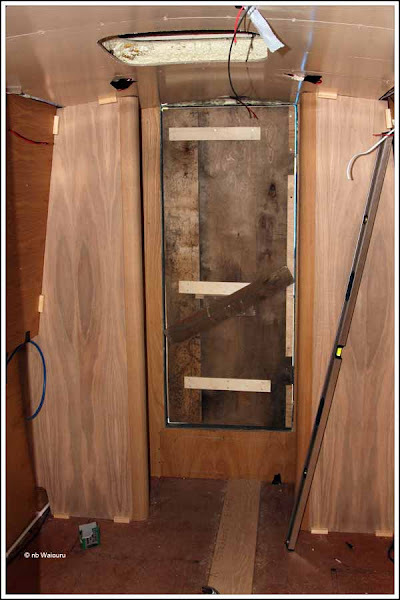 The quarter round moulded plywood is fixed to the partition by cutting a rebate in the face of the partition. This rebate is the depth of the thickness of the moulding. The moulding is then glued and screwed to the partition. 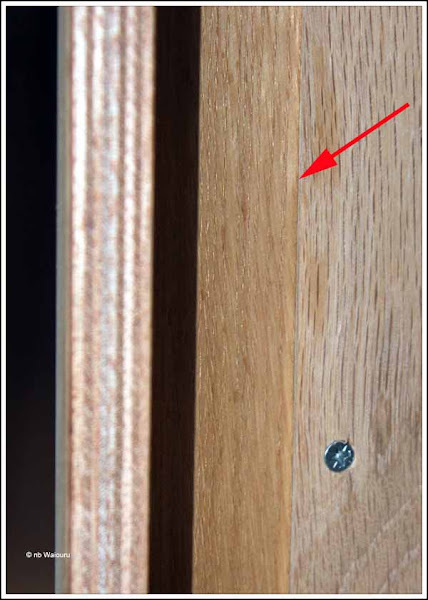 The next photo shows the reverse side of the join which is inside the wardrobe. The top half of each wardrobe will be configured for clothes hangers and the lower half will have three adjustable shelves. At the base of the port wardrobe is an access panel to the isolation valves for the diesel stove and water tank. The forward Empirbus node will go in the base of the starboard wardrobe. Meanwhile Nick, the engineer, has made a start on fitting out the engine compartment. Various shaped lengths of mild steel were delivered yesterday and today he started fabricating the mounting brackets for the engine bay components. 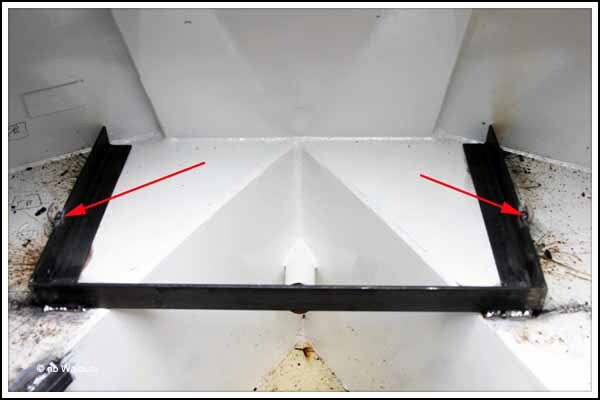 The base of the domestic battery bank has been manufactured from right-angle mild steel and welded across the swim above the propeller shaft. The timber baseplate fits snuggly inside the bracket. A chain link has been welded either side of the frame. These will be the anchor points for the strap across the top of the battery bank. A second pair of links will be welded to the hull at the back of the bank for another horizontal strap. This will prevent the batteries from falling forwards. Nick has also cut and welded a couple of box steel mounting for the engine silencer. Straps will pass through the mountings and around the silencer to hold it in place. 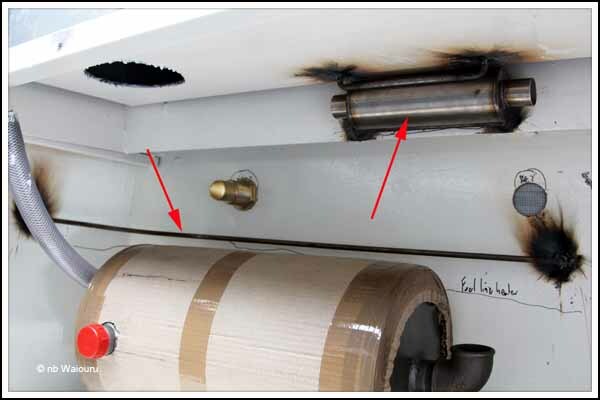 He has welded a length of horizontal steel rod on the side of the engine bay above the silencer. This will be the support bracket for the diesel fuel line to the Hurricane heater (red arrow pointing down in the photo below). Two more lengths of steel rod have been used to make a bracket for the Hurricane muffler (right arrow). Nick has mentioned he needs to confirm he can get sufficient lagging around the muffler before confirming this layout. The calorifier is on the starboard (right) swim. Nick is going to weld four chain links onto the swim as anchor points for the two straps that will go over the calorifier. Another steel rod will be fabricated and installed on the roof of the engine compartment. It will be used as a securing point for all the wiring. 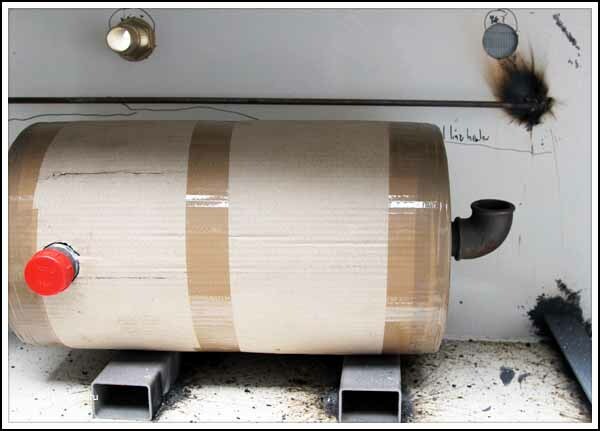 Additional brackets for small items such as filters, isolation switches, etc also need to be fabricated and welded in place. After all this work someone is going to have to get in the engine bay and clean all this mild steel before painting it. I have this suspicion I know who this will be!!! !